What do The Candy Perfume Boy and Clarins’ Eau Dynamisante have in common? They were both born in 1987 and turned 25 this year, that’s what! Such longevity in the perfume industry sure is something to celebrate and Clarins are doing so by releasing a limited edition bottle which sees Eau Dynamisante encased in a veil of red glitter. Eau Dynamisante was first released by Clarins in 1987 and is innovative because it is not just a fragrance, it’s a skin treatment too. Clarins describe Eau Dynamisante as “an innovative feel-good fragrance created from an inspired blend of 14 aromatic essential oils and therapeutic plant extracts with the power to scent skin, invigorate the sense and moisturise and soften from top-to-toe.” It’s not just innovative though, it’s also very popular and every three minutes a bottle is purchased in the UK. Now that’s impressive! Before spritzing on some Eau Dynamisante in preparation for this review I was absolutely sure that it would not be ‘my thing’. This pre conceived notion was based on the fact that citrus fragrances don’t really move me and I was convinced that I had tried it before and wasn’t wowed. I am actually quite surprised to say that I really like it and I think it is the perfect scent to combat the muggy, sweaty days of summer. The top notes hit you like a bracing wall of citrus. Mouthwatering lemon, bergamot and orange zing up your nose and surround you with a cooling, calm aura. The citrus is joined by a strong, herbal accord that tempers the sweetness whilst providing Eau Dynamisante with a green edge that smells decidedly natural. There are also tiny facets of spice and florals going on behind the herbs and citrus. Touches of lavender and ginger mix things up a bit and although they’re not entirely prominent (the citrus and herbs really take centre stage) they pop up every now and then to remind you that there is some hidden depth to this composition. Seeing as Eau Dynamisante is classified as a Citrus Chypre it is no surprise that the base is much richer and heavier than the opening. Patchouli and mosses reign supreme in this latter part of Eau Dynamisante’s development and it moves from being a bright, sunny citrus to a biting, almost bitter (in a good way) chypre in no time at all. Eau Dynamisante feels like an incredibly easygoing fragrance, it demands nothing from you. Its the type of fragrance that is perfect for unbearably hot days, work days or just those days when you don’t feel like wearing anything too involving. If I were to sum Eau Dynamisante up in one word I would choose “simplicity” and I mean that it in the best possible way, after all it does take skill to create something so well balanced, calming and easy to love. One aspect that some may not find easy to love however, is the longevity. Eau Dynamisante isn’t exactly ephemeral but it does subdue quite quickly, but not to worry I have a solution! Buy a big bottle and spray with reckless abandon, you’ll want to experience those bracing top notes again and again. The Limited Edition Glitter Bottle is available in 100ml size for £29. PR Sample. Notes and quotes via press release. Image 1 essential.com. Image 2 sunshields.co.uk. Posted in Chypre, Citrus, Clarins, Perfume Reviews, Unisex and tagged Chypre, Citrus, Clarins, Eau Dynamisante, Limited Edition, Unisex. Bookmark the permalink. I think that was my very first perfume as a girl… must smell it again for old times sake – and because it is still quite good! You are most definitely not old! Even when you weren’t a fumenerd you had good taste! Yay – Happy Birthday indeed !! – Glad to hear you enjoying it. 🙂 It’s totally addictive I tell ya ! It really is addictive, it’s that biting cites in the beginning that I really love. I agree re Clarins skincre, the stuff is good! Their skincare is superb, it’s true! And a very good value for the money. Sounds like something for me. I love chypres and I love citrus. And when the fragrance is simple and bitter, it’s even better. I saw it numerous times sitting on the shelf of Clarins counter but I always thought that it’s a face gel!? Will have to try when I’ll be visiting Sephora next time. 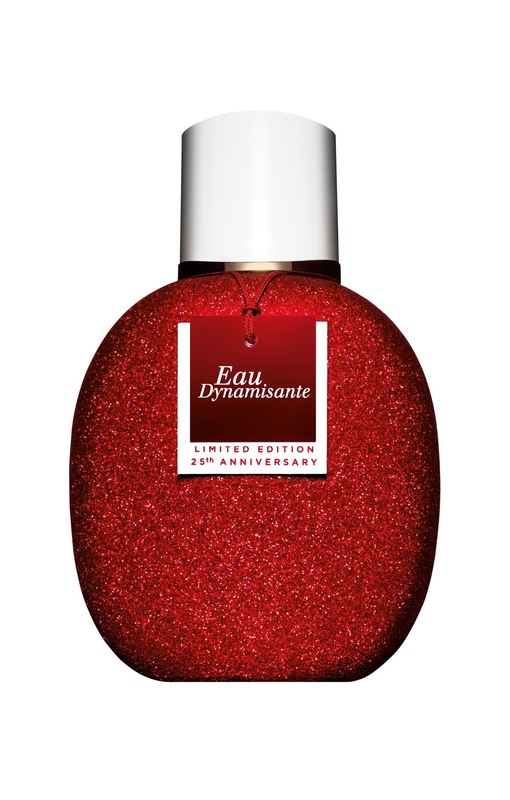 The anniversary packaging of Eau Dynamisante looks nice, but it will probably leave some glitter on your hands once you grab it. Ha, I can see why you thought it was shower gel, it looks just like it! I did think the same about the glitter, but it doesn’t seem to rub off at all. I love Eau D! My first job in cosmetics was at a Clarins counter in ’98. Ever since then, I’ve worn it in and off, and now my husband wears it too. His fave citrus chypre is Lauder’s Azuree however. Clarins used to have a lovely perfume called Elysium – sadly long discontinued. You and your husband have good taste! 25 years is a long time in the world of fragrance. Perfume years are kind of like dog years. I also have the idea that I don’t like this but I haven’t tried it for about 15 years so it looks like I need to get reacquainted. Maybe like you, it will turn out that I like it after all. I had no idea this is also a skin treatment and is so popular that a bottle is sold every 3 minutes in the UK. I need to find out what I’m missing! Ha, “perfume years are kind of like dog years”, I like that, it’s very true! Ive had numerous bottles of Eau Dynamisante but haven’t at the moment as Ive just got Wrappings for my herbal fix and have numerous other citric chypres to play with. I must go have a sniff for old times sake though. Sounds like you’re all set for citric chypres! I had almost forgotten about Eau Dynamique, one of my faves from my high school days. ED is 25 years old, and Aromatics Elixir, the other scent I wore for a long time, has turned 40. I’m feeling oldish! Wow, Aromatics Elixir is 40?! I didn’t know that! Sorry, I meant Dynamisante. AE has a 40th Anniversary Special Edition that is a more modern take on the old favorite, but I still like the old one better. The packaging on the new AE is really beautiful though! Was that the perfumer’s reserve edition? Ahh, that one was rather lovely indeed. I love this perfume, it is so cheerful. I really need to get a bottle. I also love how Clarins associates will clean this counters with this stuff – supposedly it has antibacterial properties? I don’t know if I quite believe that but I love that they spritz it freely. Really? That’s weird! I can’t imagine it had antibacterial qualities! Those counters sure smell good! Yes! When I worked in cosmetics retail I learned all this stuff. I don’t really believe it either, but I’d rather the smell of Eau Dynamisante than generic Clean-o-Fresh spray! Wow, I haven’t smelled this in years. Totally forgot about it really. You have got me thinking I need to stop by the Clarins counter and give it a try. It doesn’t sound like something I’d usually like but I remember liking it ages ago so I’m curious to see if I still do. It may very well be antibacterial too because lavender is antibacterial and I think rosemary and aloe may be too. But don’t quote me on those. Do stop by Clarins, like you I didn’t think it was something I’d like but was pleasantly surprised. Oh the memories this brings back! I used to wear it when I was studying in Nottingham…. Happy Birthday, Dynamisante! Sounds very “cooling” I might have to try this…the Texas heat wave is killing me. It is the perfect thing to combat the heat! I bought Eau Dynamisante when it first came out, and again intermittently over the years. Loving Eau des Jardins at the moment. EDy hasn’t changed at all which is a big plus for quality control. I miss Par Amour which was discontinued a few years ago – delicious rose and sandalwood. I need to try the Eau des Jardins trio, I’ve heard good things.